Yesterday night we bombed through the night up to Eugene and pulled in very sleepy to this very sleepy Willamette Valley town. We'd managed to cram all of out instruments and stuff into the van and pull away from the Big Yellow House in Santa Cruz very close to when we were scheduled to leave. I've not traveled with this many people before on a road trip, so I was surprised that we are getting along relatively well. The number of screaming knockdown fights and knife battles has remained relatively low. Only a certain general malaise and spaciness has reigned due to lack of sleep. Collectively, we might have gotten 8 hours of sleep. 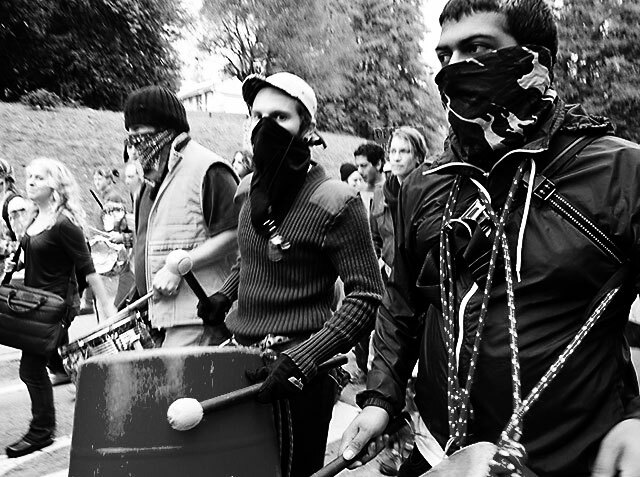 Blackbird Raum, Street Drum Corps, Gillian Welsh, blasting from the van on a marathon drive. Late in the night, a diatribe by Jimmy Swaggart on the hellish demon of drug use. Amen, brother Swaggart! 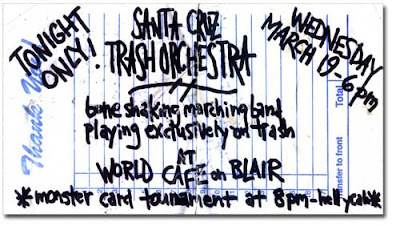 We played tonight at the World Cafe in the Whittaker Neighborhood of Eugene. Proprietor Bill, a friend of hobos, was kind enough to set us up on short notice. Delicious vegan pizza and fabulous beer, a light but enthusiastic turnout, and good practice for the next few days of marathon performance. During breaks in the performance we overheard cute kids talking about Anarchism, and knew we had some kindred souls in the audience. Talking to them, we found they were from the Lorax Manor, a long-standing student co-op in town - a virtual mansion. Afterward, we were invited over to the Lorax for a rousing game of Monster Cards, a brilliant & creative DIY card game taught to us by sweet Portland kids years ago.